Imagine going to an ice cream shop. As you walk through the door the walls covered with a hundred freezer drawers. Inside each drawer is a different flavor of ice cream, but only just a spoonful of each, and every flavor is one that you enjoy. You open a drawer, sample the ice cream, and savor the flavor, only to have disappointment set in when you realize it’s gone. But you smile because you’ve got a whole bunch of flavors to try, and it keeps you going. And because it’s only a small amount—just a taste—there’s no stomach upset afterward. 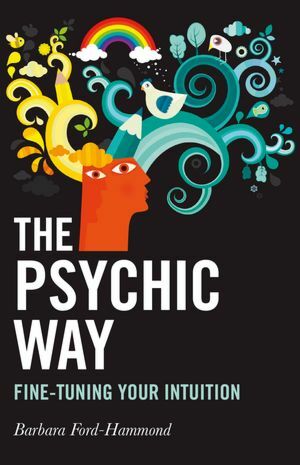 You’ve just experienced what reading The Psychic Way was like for me. It is filled with lots of different techniques to improve your intuition. A number of them I’ve used before, and some I haven’t, but I felt like each one was just a morsel of total bliss. I found myself wanting more of, well…just about everything! And that may well be the point: To give the reader an idea of what kind of intuitive development techniques s/he might enjoy to explore them further through practice as well as books and classes. Take the chakras, for example. Lots of us work with them, study them, meditate with them, and teach them. Ms. Ford-Hammond has a chapter in the book on them. It has a nice intro for those new to chakra work, a quick list of the chakras and their associated colors, and some exercises to try. Whole books have been written about the chakras, but if you’re new to it, you just get a taste. If you like it, maybe you’ll take a chakra class at a local metaphysical store, or buy a book on chakras, or do a Google search to increase your knowledge. Don’t like the “taste” of chakras? There are plenty of other flavors to choose from. If not for this book, you might never have known that you did or didn’t like the “taste” at all. One of my favorite chapters was called “The Clairs”. I’m talking about clairaudience, clairvoyance, clairsentience, claircognisence, and several other “clairs”. Many people have intuitive feelings and don’t know what to call them. I have no doubt that a number of people who read this book shouted, “Oh wow! That’s me!” when reading the individual descriptions of the techniques. One point that I thought was valid was for the student to understand that these can be mixed together; like the five senses, you may rely on one in particular, but together they can be quite powerful. For someone just touching the edges of their intuitive power, this could be a very important message. I also liked the stories. After you read some of the accounts in this book, you’ll question what you call “coincidence”. The narratives hammer home the point that any person has the ability to develop their intuitive gifts. One of the few disappointing aspects of this book was that like the fictional ice cream shop, there were not enough stories, and some of the chapters weren’t long enough. I was just starting to enjoy reading about auras when the chapter ended four pages later. This book is great for beginners and anyone unfamiliar with the intuition and how to make it more effective. If you’re looking for a way to develop your own gifts and you’re not sure where to turn, it’s a great resource. Personally, I’d give it as a gift to people who doubt their intuition or who are really interested in learning more but don’t know where to begin. Sometimes you want a big bowl of your favorite ice cream flavor: Swiss chocolate almond, peanut butter ripple, peppermint stick, or just plain old chocolate. But The Psychic Way lets you experience a lot of different flavors in a neat little package, and is a great place to start. And keep those freezer drawers closed so the rest of us can have a taste!